"I just put my hand on the door like this up there and I’m like who's in there? 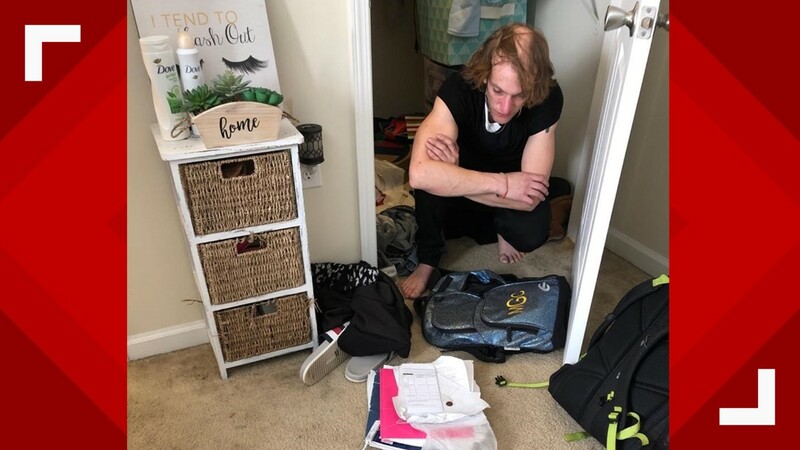 And he answers me and he’s like ‘My name’s Drew.’"
GREENSBORO, North Carolina — A UNC-Greensboro student came home to her apartment to find something totally bizarre and unexpected on Saturday - a man was sitting in her closet, wearing her clothes. Maddie asked that we use only her first name for this story. She said she heard strange noises coming from her closet. Maddie continued talking to the man because she said she was in shock. "Before I open the door -- are you gonna do anything to me? Are you gonna do anything? And he's like no, no, no." She tried making an emergency call on her Apple watch, but couldn't get it to work. "I could feel him starting to push the door open so I was like I guess I have to open the door," said Maddie. She said she opened the door and found the man sitting on the floor, wearing her clothes. 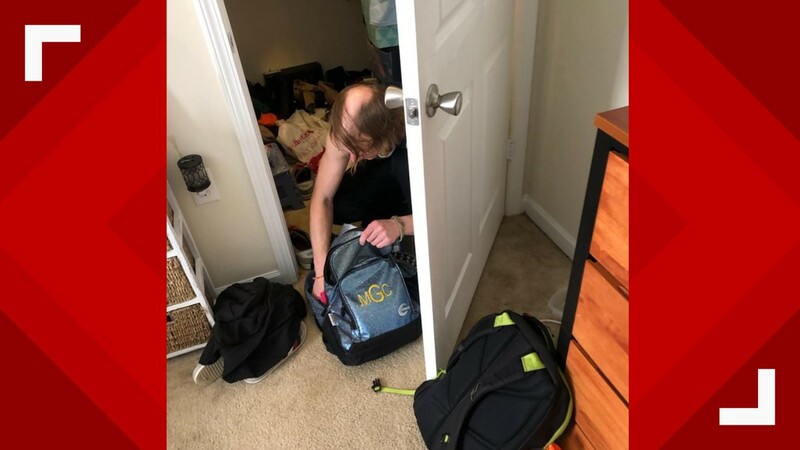 He had a bag full of her clothes, shoes, and socks. He begged her not to call the cops. Maddie said she talked to him for about ten minutes, and texted photos to her boyfriend to let him know what was happening. "He was telling me everything about his life and basically how he got in my closet." Maddie's boyfriend showed up, and that's when the man left the apartment. Police arrested him at a nearby gas station. 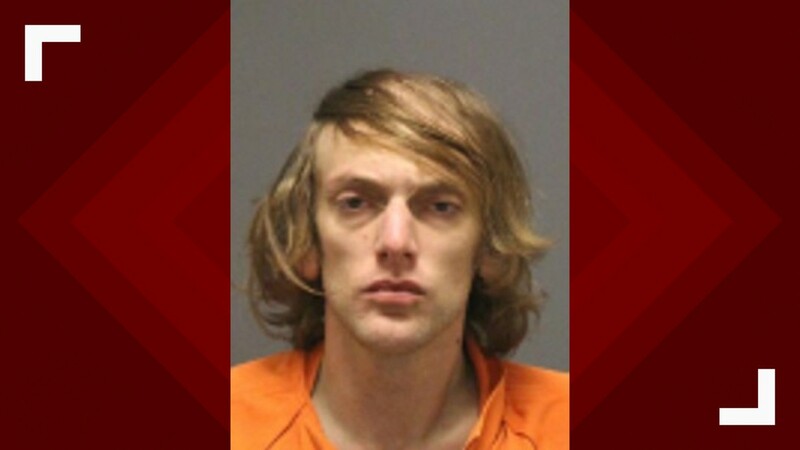 His name is 30-year-old Andrew Clyde Swofford and he was charged with misdemeanor breaking and entering. Maddie says she thinks Swofford has been in her apartment before. She says sometimes she would notice things missing or out of place, but she thought it was just her roommates. "We always joke that there’s a ghost in here because I’ve been missing clothes since I’ve been living here, like shirts – like a shirt at a time or pants at this time – it makes me think he’s been here before." "I'm leaving tonight, yeah, just signed a lease for a new apartment."